One of the first and most noticeable things about times square on my last visit was a lone young individual holding a sign in his hand. Before I even came up to him I could tell this was a very serious individual who was visibly committed to his cause. A firm tall posture, upright sign, and an unwavering stare into the multitudes of passing visitors and guests who came to one of the most visited destinations in the United States. It was hard to picture how a protest could be arranged by just one person after seeing so many organized protests and marches put together by massive crowds and money-backed organizations. However I was much more impressed with this display – it took much more courage to be the only one standing and not having the ability to disappear into a screaming crowd where your personal responsibility is spread out minimizing your own risk to whatever protest was taking place. Whatever this young man was doing took a lot of courage – and you simply must respect something like that in our society. When I first walked up to Wesley Gore I asked if I could hold the sign to take a picture. A cardboard flat square with red letters that read “TV is Brainwashing.” The sign appealed to me naturally and I barely watch TV anyway – and then again, how cool would it be to have a picture of me holding that sign in Times Square? Clearly I was taken in by the novelty of it, but Wesleys first reply to me made it very clear that this was no simple matter. What use is just taking a picture with a sign? Better yet, if you agree, why are you not here with your own? Wesley Gore perhaps summed up the current political climate in the US in a very brief phrase – indifference and general apathy. Many people agree with the sentiment as well as many others, but very few, the brave few actually take the message to the streets. I was more impressed with Wesleys mannerism and sincerity than I had originally anticipated. This is what it looks like when someone honestly and truly believes in something. At that point it didn’t even matter what it was – the entire process deserves attention and appreciation. Appreciation for US freedom and citizen action. Appreciation for an individual – the very few left – who do not need a crowd to hide behind or TV screens to force the conversation. Wesley Gore was sending a message without even speaking a word. He was at the right place with a message everyone agrees with even if it’s tucked deeply away behind political correctness and general fear of authority. 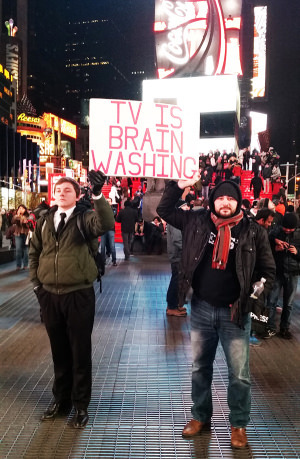 His sign was another light bulb going off for those who tried to suffocate the pressing issues of modern America. You see it wasn’t an issue about proving who could stand in the cold the longest or about how brave an individual was. The biggest message is that we have some serious problems going on in our country. The message is that you are in a fight for your own identity and future and there are very serious and daily processes which are in direct opposition to your well-being. From the banking system which enslaves many into perpetual and life-long debt, to manipulation of opinion and mind control through propaganda the tools and powers that be are at work in our daily lives through the food we eat, the programs we watch, the news we read. Wesley Gore understands that many are losing the fight and slipping back away into the blissful ignorance where ‘see no evil, hear no evil’ is the going rate. Whatever your position is in regards to the future of our country, or how you feel about the government, I think we can all agree that it is refreshing to see such strong individuals taking advantage of their rights as a US citizen to openly protest and be heard in the most professional of manners. When most rather stay indoors or coward out, Wesley Gore will be out on the streets trying to fight for your and my rights. And that’s a good thing. Videos The West Won't Show You About Ukraine Part 1 (Translated)Does America Want War?